Welcome Arch looking east on I street. Rich in agriculture and industry. A good place to live a good life. Having a wonderful vacation -- Wish you were here. The slots aren't paying off but the weather man is. Phil. Hi, Herb & Viola -- Here for a few days enjoying nice autumn weather. Not doing too badly so far. Lots of new construction. Charlie. 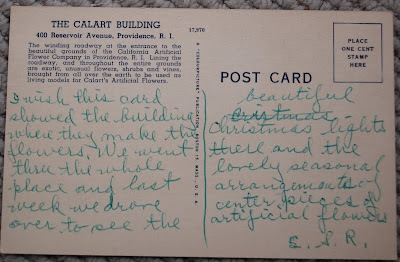 400 Reservoir Avenue, Providence, R.I. The winding roadway at the entrance to the beautiful grounds of the California Artificial Flower Company in Providence, R.I. 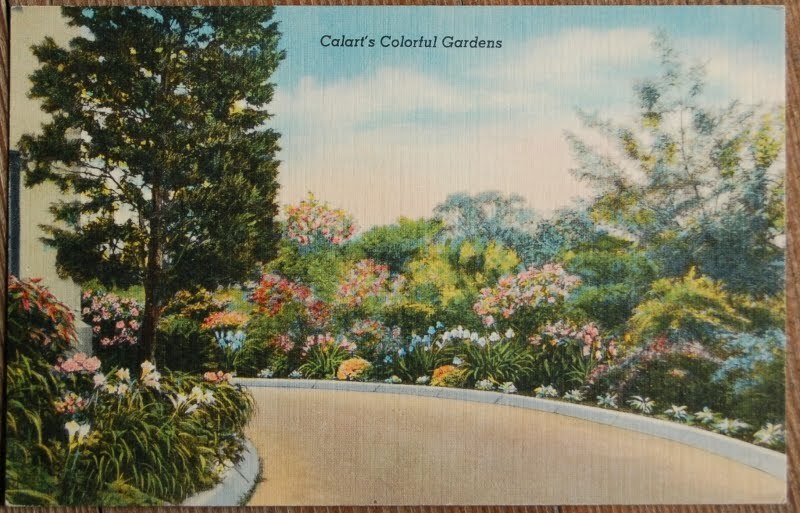 Lining the roadway, and throughout the entire grounds are exotic, unusual flowers, shrubs, and vines, brought from all over the earth to be used as living models for Calart's Artificial Flowers. 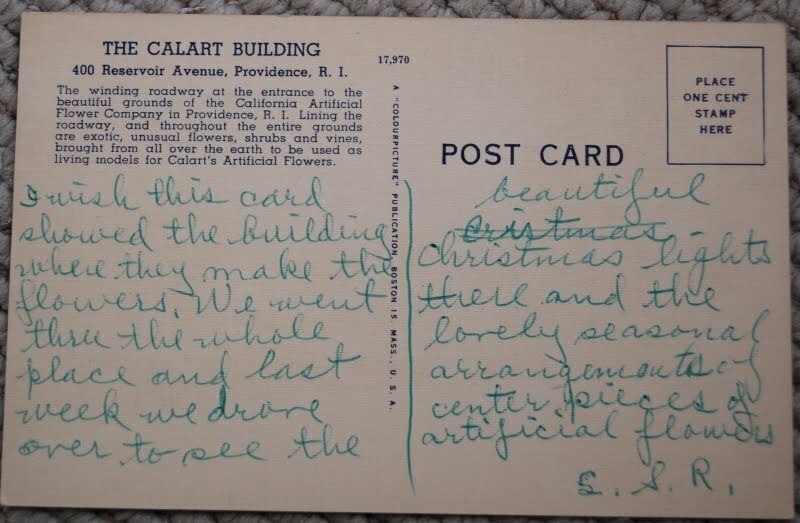 I wish this card showed the building where they make the flowers. We went thru the whole place and last we we drove over to see the beautiful Cristmas Christmas lights there and the lovely seasonal arrangements of center pieces of artificial flowers. 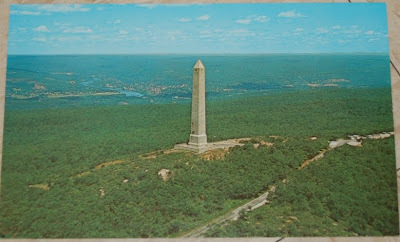 S. & R.
The base of this 220 feet tall monument is erected on the highest point in the State of New Jersey at an altitude of 1803 feet above sea level. 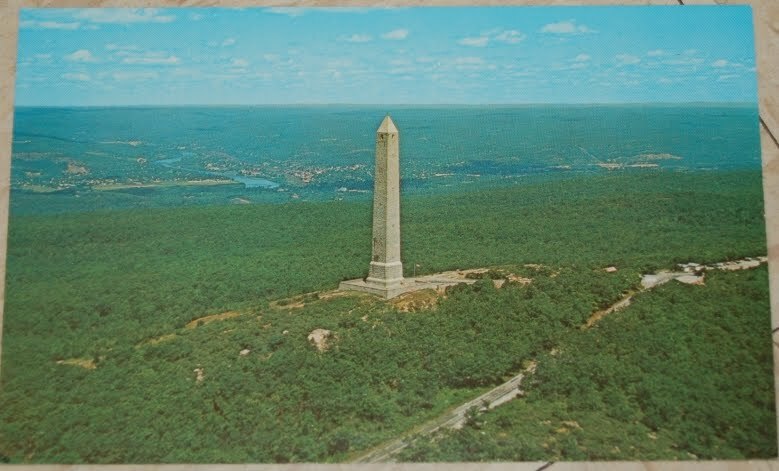 In the background of this view is the Delaware River and the city of Port Jervis, New York. May 1st -- About 25 of us west her for a picnic today on bikes -- about 2 hr. 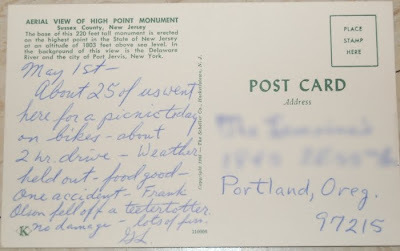 drive -- Weather held out -- food good -- one accident -- Frank Olson fell off a teetertotter. No damage -- lots of fun. GL. 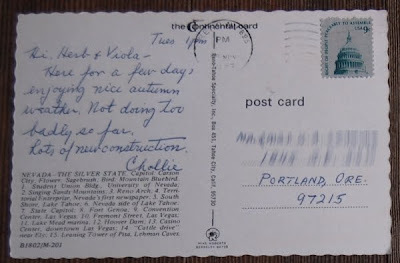 As much as I hate to admit it, you can continue to provide us with boring postcards. 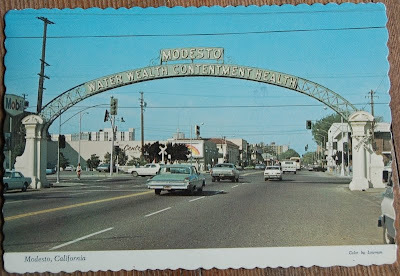 I hate to break this to you, but Modesto no longer boasts the fancy arch. The town square is nice, though. 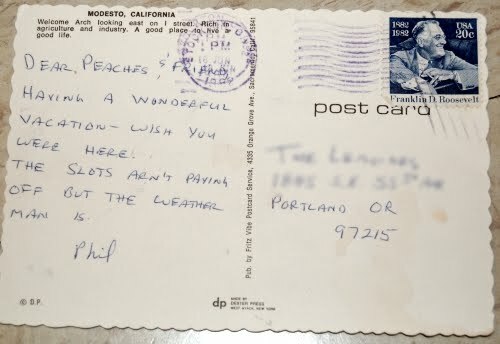 Were people hard up for fun in those days? The town is actually called 'Modesto'? That's wonderful. Please tell me there's a superhero who comes from there. CC: You hate to admit it, as in, you grant me permission because you have grown fond of the genre despite yourself? You hate to admit it, as in, you have sensed the size of the collection and realized that I will never run out of material? You hate to admit it, as in, you concede that with a continent in between us it just isn't worth it to make the trip out to strangle me? 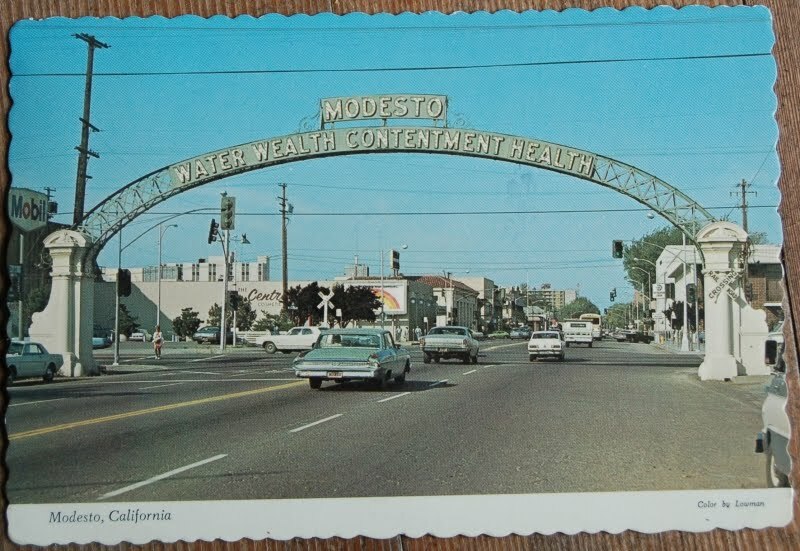 Elaine: Modesto apparently still boasted the fancy arch as recently as this January. The CalArts Artificial Flower facility, however, appears to have gone to graveyards, everyone. 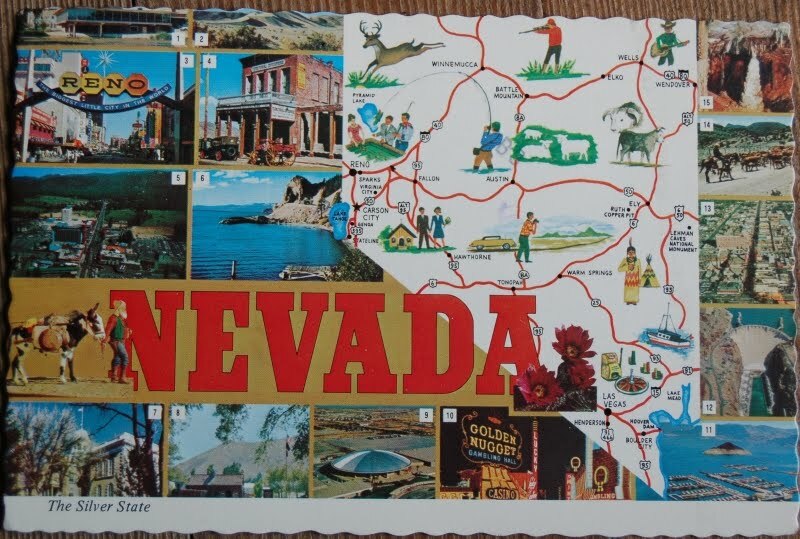 Owl: California -- which was once called, you may know, "the Northern part of Mexico" -- is chockablock with Spanish Catholic placenames. Of the four big cities, for instance, two are saints (Diego, Francisco), one is "Sacramento," and one is the great City of Angels. Alas, Modesto is not home to any superheros to my knowledge, although it is the hometown of George Lucas, for what that's worth. I was aware of this, but 'Modesto' (presumably "City of Modesty") is a pretty sweet name. I also note that the local baseball team are the "Modesto Nuts". It's almost enough to make me pack my bags and move to California, does anyone know if there's jobs going in the community health data industry in town? Seems to me a town with the slogan "Water Wealth Contentment Health" is the sort of place where a community health data professional could write his own ticket. 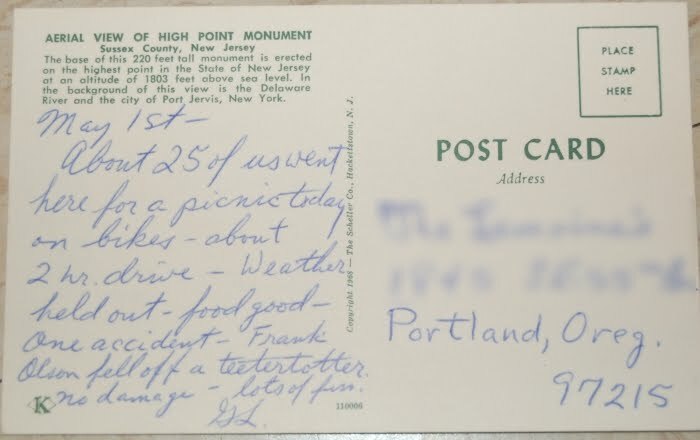 Ah the childhood memories of going to High Point State Park! Note the long, strenuous hike required from the road. That crazy Frankie never could stay on a teetertotter. I'd pack my bags right now, except that you crazy Americans don't play cricket. Heh heh, sure we do! It's just that we call it "soccer" here! Aye, and we call baseball "Gridiron". It's a crazy, crazy world.